Proven Transonic technology, trusted in commercial facilities and homes worldwide. 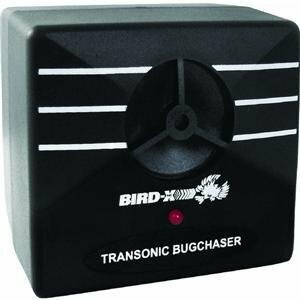 Specially designed to target insect, spider & small rodent pests with the frequencies they hate. Glue, traps and poisonous chemical repellents are no longer needed. Just plug it in and watch critters disappear. No mess and no fuss, the Bug chaser takes care of itself with little maintenance or upkeep. With a coverage area of up to 1500 square feet, no space is safe for the crawlers. Garages, basements and kitchens are only the beginning. From commercial facilities to crawl spaces, the Bugchaser lives up to its name. Use this device in porches, mobile homes, storage areas, warehouses and factories. Eliminate pest liabilities in restaurants, pantries and cafeterias. Pet-friendly and environmentally sound, Bugchaser takes the worry out of pest control. Harsh chemicals are a thing of the past! You, your children and your pets are safe from poisonous toxins. Sick of paying �the terminator� for the spider problem? And scheduling those regular sprays? The Bug chaser eliminates the hassle. With a choice of three settings, this low-profile device lets you choose the sound pattern to match your pest.